I mean, it WAS snowing.... Not anymore. There is no sign that snow was ever here, to be honest. 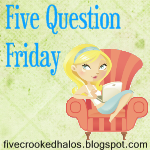 Anyway, now it's onto Five Question Friday hosted by the fantabulous Mama M over at My Little Life! 1) Favorite gift you are GIVING this year? Well, I am giving Jason something absolutely spectacular! I am SOO excited about it I can barely contain myself. I want to tell him! I NEED to tell him! But, alas, I cannot. *sigh* I don't think he reads the ole' blog too often, but I don't want to chance it.... So, I'll share it with you all once he receives his gift! Yay! 2) How many parties are you attending between now and Christmas? To be honest, that answer is a big, fat ZERO! I don't think my office or Jason's office will be having parties this year. You know, the economy.. yadda yadda yadda! (Thank you Seinfeld!) And nobody else I know is having a party, so we will be hanging out at home on our weekends. And to be honest, I could care less! We are not going to have much alone time once this little baby pops outta me in two months. So... Yea..! :) Plus, what's a Christmas party when you can't drink?! 3) What is your favorite Christmas song? Oooh, that's a hard one! I actually love "Christmas Pipes" by Celtic Woman and "Wintersong" by Sarah McLachlan. I guess those would be my two "unconventional" Christmas songs. For classics I'd say "Carol of the Bells" and "Baby It's Cold Outside"... I just LOVE ALL Christmas music! 4) Who was your favorite elementary school teacher and why? I do not know... Mmmm... 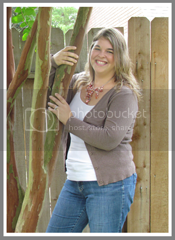 Probably Mrs. Crichton in 5th grade. She put up with all of my antics in class even though I was constantly talking and being a "trouble maker". I was a GREAT student though, so she handled it well! She actually kept my name up on the board all of the time because she knew she'd have to write it on there atleast once a day anyway. But, she was a great teacher! 5) If you had a choice to live in any other period of time (other than now) what era would you choose and why? This is a tough one! I'd love to experience so many different times in history.... I think a very exciting, yet turbulent time, would have been Ireland from 1910-1930. That would be pretty cool to see! Well, that's all! Enjoy your evening! I love, love, love Wintersong. Good call! Snow in Texas? Wow. Can't wait to see the pics! Where are y'all at? The Hus works in Houston and he hates his drive..we're thinking about moving closer, but we like it here so much...what to do..what to do..